Saturday was the 10th year for the Face of America Ride, which pairs an able-bodied rider with a wounded warrior. WASHINGTON — On Saturday morning, hundreds of cyclists and more than 150 disabled veterans began the journey from the Pentagon to the battlefields of Gettysburg. It was the 10th year for the Face of America Ride, which paired an able-bodied rider with a wounded veteran. 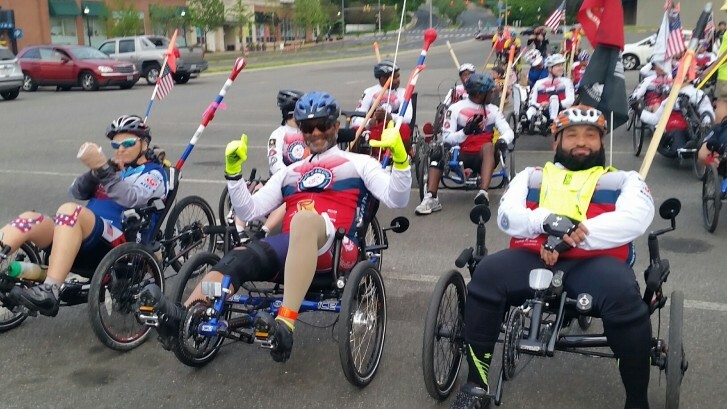 The two-day, 110-mile bike and hand cycle ride honors wounded warriors who suffered from life-changing injuries. It’s not a race. It is a ride. The only competition is how far a disabled veteran can push his or herself in an environment surrounded by a team. Something interesting happens during this trek: These vets get back a little piece of themselves. “It gives you an environment that allows you to push yourself to your limit because you know you have a team around you,” said Army veteran Chris Levi, who rode a hand cycle on Saturday. Levi lost both legs and his wrist in March 2008 while deployed to Iraq. This was the fourth year that Levi has done the ride. He said that next year he is hoping to ride on an upright tandem bike with an able-bodied rider. This year was the first time Marine veteran Rachel Fredricks participated in the ride. “I had an injury during my service time and now I’m disabled. And now I ride a hand cycle,” said Fredricks, who is from upstate New York. She said her hand cycle was special. Before the ride got underway, Van Brinson who heads up the ride, asked the riders to join him in doing 22 push-ups for the 22 military service members who commit suicide every day. He said this ride has grown from about 100 riders. “We have over 600-riders participating and more than 150- are disabled veterans,” Brinson said. Also, this year a second route was added. Brinson said on Saturday morning a group of rides left Valley Forge, just outside of Philadelphia, and headed to Gettysburg. In 2002 and 2003, the Face of America Ride, was known as the official Sept. 11 commemorative ride from New York to the Pentagon.